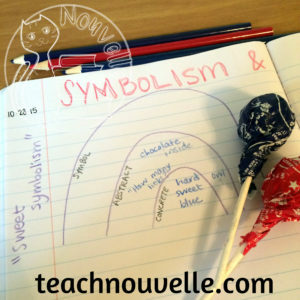 I have been reflecting on my favorite lessons from the school year, and one of the most fun and effective was teaching symbolism with Tootsie Roll Pops! Not only were the students enthusiastic about eating the candy (because aren’t they always? ), they really grasped the concept of analyzing a symbol. We were nearing Halloween and deep in our Short Stories unit, and I planned for my 9th graders to read “Masque of the Red Death” by Edgar Allan Poe. They had already told me in their journals that they didn’t “get” symbolism. I wanted to help them learn to take apart symbols and analyze them based on concrete details before adding in the abstract traits and drawing a conclusion. Basically, I wanted to help them break down symbols and realize that there was a lot of room for interpretation. 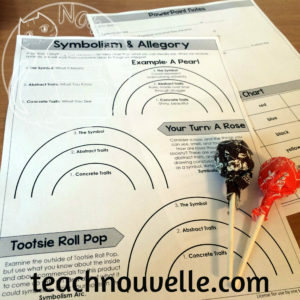 Tootsie Roll Pops® are perfect for teaching symbolism because they’ve got some obvious concrete qualities and some cultural baggage to analyze. Concrete Traits – Students identify things they can see, smell, feel, and taste about the object. Abstract Traits – Students brainstorm what else they know based on society, cultural traditions, commercials, etc. This category can also contain things they can’t see, but that they know to be true anyway. 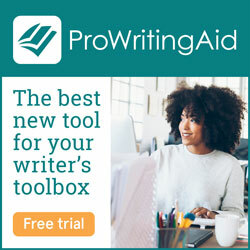 The Symbol – They make a connection between these traits and consider what “idea” may be shouldered by this object in the text. Obviously, they are infusing the Tootsie Roll Pop® with symbolism, but when we return to Poe, they will consider the tone and mood of the text before drawing these conclusions. by signing up for my monthly newsletter! This lesson is available for Interactive Notebooks and as a traditional worksheet at my TeachersPayTeachers store. This introduction to symbolism was such a hit! We ended up watching the old Tootsie Roll Pop® commercials because some of my students hadn’t seen them, and it was a great introduction to “cultural baggage”. I immediately connected this to “Masque of the Red Death”, and references that Poe’s audience would have easily understood. Also, can I just say that listening to 9th graders invent symbolism is pretty awesome? Clearly, Tootsie Roll Pops represent people who look good on the outside, but are a glob of grossness on the inside. Also, they represent life’s challenges, and a wonderful reward after hard work. As you can tell, there were mixed opinions about Tootsie Roll Pops in my class! After this introduction, we went through a PowerPoint about Symbolism and Allegory, and worked more on a general symbolism inventory. Huge success! 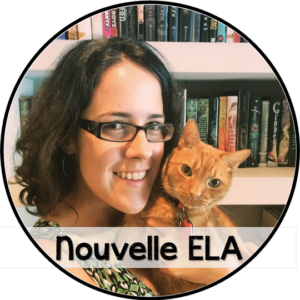 Do you want to know more about how I use Interactive Notebooks in High School? Click here! 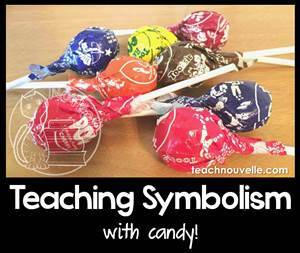 What’s your favorite way of teaching symbolism? What’s your favorite candy to teach with? Please let me know in comments below – I love hearing from you! Tootsie Roll Pop® is a registered trademark of Tootsie Roll Industries. The author of this product is in no way associated with or endorsed by Tootsie Roll Industries. I love this!! I actually stumbled upon your site through Pinterest and am excited, especially, to see your use of Interactive Notebooks in the HS classroom. I’ve been teaching JH ELA for years, but this is my first year moving up to 10th grade. I have enjoyed seeing how you are incorporating these in the upper levels. Thanks so much for sharing!! Thanks so much for the comment! I also moved from JH to HS, so I definitely wanted to use ISNs with my older students. I am slowly working on getting up more posts about this now that I’m on summer vacay. What are you most interested in hearing about next? In addition to Short Stories, I used ISNs with novels, drama, poetry, and research. Saw your pin on Pinterest! Love this idea; I will for sure be doing it this year! This was so interesting – I can just imagine the great thinking students were doiong! Thank you for this, I actually teach 11th grade but they still struggle with this concept. Thanks for the great idea. I will let you know how it goes.